Sprinkle the spices and a pinch of salt over the fish. Heat a pan and fry the fish on all sides until cooked. Remove and set aside. Add the onion and celery to the same pan and sauté until soft. 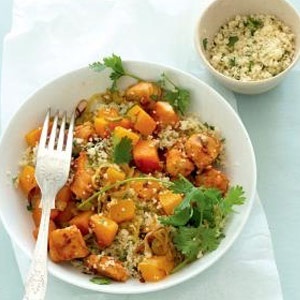 Steam the butternut or cook it in the microwave for a few minutes until almost cooked. Pour enough boiling water over the couscous to just cover. Cover the bowl and leave for 3 minutes. Fluff with a fork. Add the butternut and fish to the pan. Sprinkle with coriander and season with salt and black pepper to taste. Add to the couscous and stir through gently. Serve warm or cold, garnished with coriander.